The great horned owls are ultimate Americans. From half way to the northernmost portions of Alaska and Canada, all the way down to the south Amazon basin, you'll find the great horned owls of the Americas. There are lots of humans living within the same territories where the great horned owls are found. Great horned owls demand and are deserving of respect, and if you don't think so, try getting at some or one of the owl's eggs. These owls are the only known bird of prey to have ever killed a human being. Yes, the silly dead human tried to get some owl eggs; bad decision, that. The great horned owls are predators. Ever hear of a predator that doesn't protect its young or its territory, or itself? No, you have not. Great horned owls can and do attack humans when they feel threatened, and they should do so too. Humans tend to not much respect each other, much less other earthlings. Disrespect great horned owls at your own peril. The attacks make the news when they occur. Here's a helpful hint, the great horned owl is liable to see your behavior as disrespectful or threatening even when it isn't. The picture below is of a man who was collecting rabbits from his snares in the woods. Perhaps the owl recognized the human as a threat to his diet? Owls aren't stupid, you know. 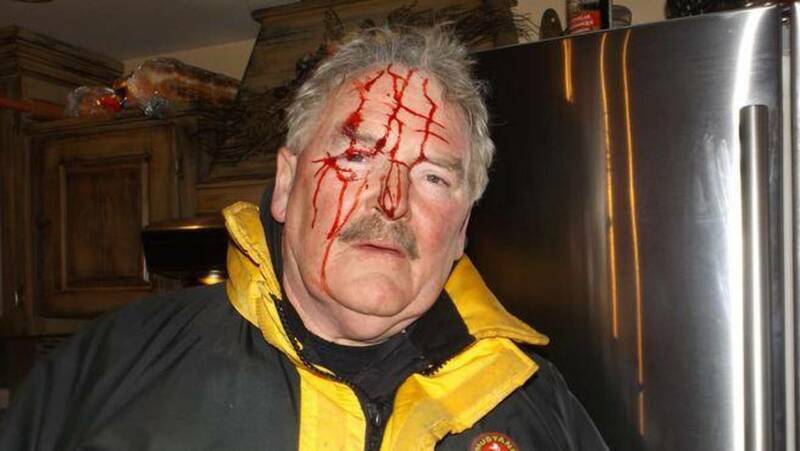 The result of a Great Horned Owl attack. All predators are territorial, and the great horned owl is no different. These owls are known to at times dive bomb humans. If you know good and well you are in an area where owls are attacking, then you should carry an umbrella. When it is raining owl talons, yes, an umbrella, thin and simple as one is, can provide some deterrence. The great horned owl's talons are the dangerous thing, that and the fact you won't be looking for one when one is looking to injure you. Five hundred pounds per square inch is the pressure said owl's talons can exert against your skin. Losing an eye is certainly within the realm of possibilities. The strength of the great horned owl's talons is comparable to that of a golden eagle, or to that of a German shepherd's bite. It is illegal for you, for me, and for the largest part of the population to possess a great horned owl, or any part of one. Obviously, it is illegal to kill a great horned owl. These owls are federally protected. We're talking felony charges here. You do not want a felony record. Now, that all said, you have every right to protect yourself from a great horned owl, you just don't have the right to kill one outside the realm of an incident where one is actually attacking you or someone with you. While owl attacks do happen - it's probably not a thing you should worry your little head over. Me? Heck, I'm forever pleased when I even get to see an owl, any owl. A super predator like an great horned owl isn't the type of creature that poses for cameras. Even when I've been out and listening to owls hootie hoodie hoo-ing, I typically don't see them, as it is typically very dark outside at those times. These are nocturnal predators. 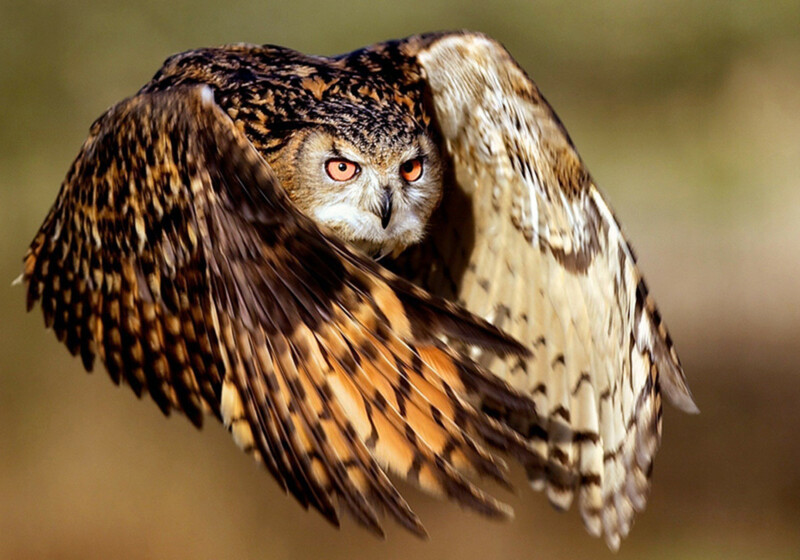 Great horned owls are mythological birds. The great horned owls play a part in our popular culture, and our folk tales too. In the Harry Potter stories there is Eras, a messenger great horned owl who plays a role alongside a snow owl. There's little surprising about this, as the wizard Merlin was overly fond of owls, his owl's name was Archimedes, and Archimedes was a rather important character to the tale of The Once and Future King, and a pretentious sort of bird besides. Either of the above examples are pop culture references. What about mythology? Well, all owls, not just the great horned ones, are mythological birds. More often than not, owls are thought to be harbingers of doom. One can only imagine how early peoples would react to a nocturnal raptor which seemingly has devil's horns on its head, and the ability to rotate its head to alarming angles. So what do these semi-mythical and powerful raptors eat? Meat, of course, they eat lots of meat. Fresh meat, wiggling meat, that is how the great horned owls like it. Of course, a diverse diet is advantageous for any animals survival, and the great horned owls have a very diverse diet. This also, this diversity, goes a long way towards explaining the owl's very large range of dominion from the skies. Great Horned Owls have the most diverse diet of all North American raptors. 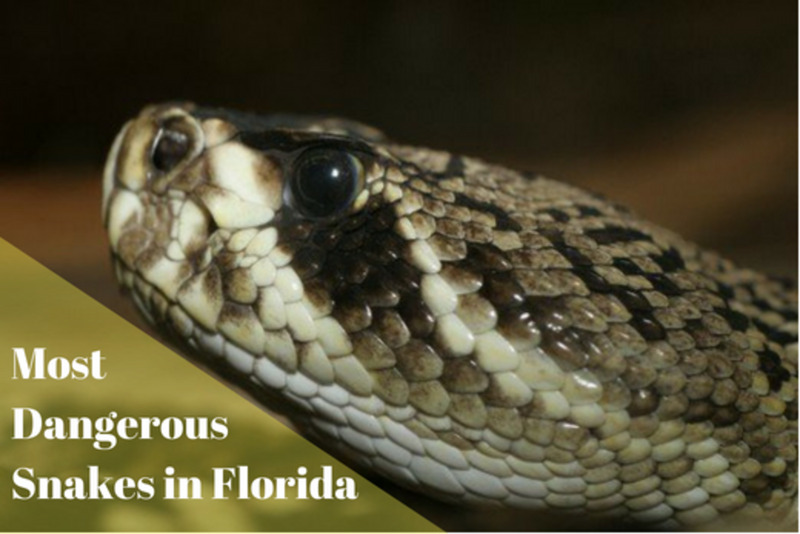 Their prey range in size from tiny rodents and scorpions to hares, skunks, geese, and raptors. They eat mostly mammals and birds—especially rabbits, hares, mice, and American Coots, but also many other species including voles, moles, shrews, rats, gophers, chipmunks, squirrels, woodchucks, marmots, prairie dogs, bats, skunks, house cats, porcupines, ducks, loons, mergansers, grebes, rails, owls, hawks, crows, ravens, doves, and starlings. 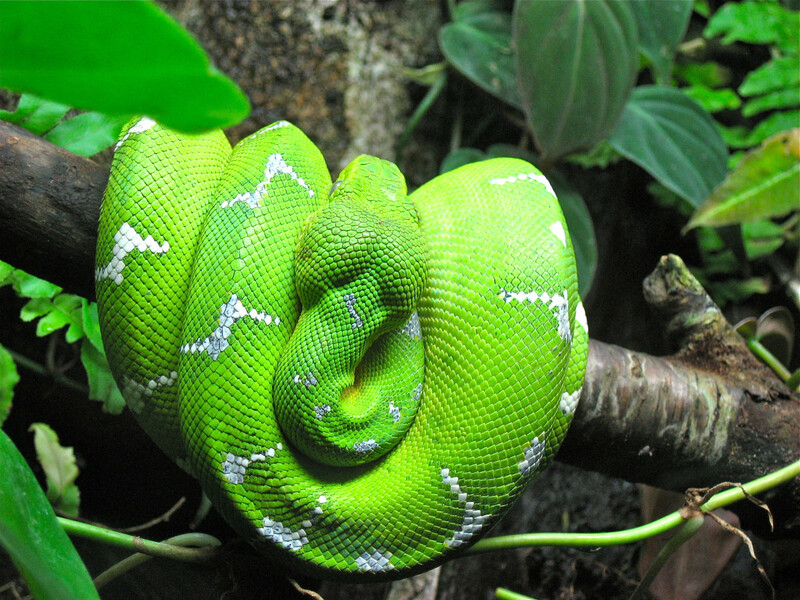 They supplement their diet with reptiles, insects, fish, invertebrates, and sometimes carrion. You get the idea, right? These birds are all out predatory, they eat other owls even. 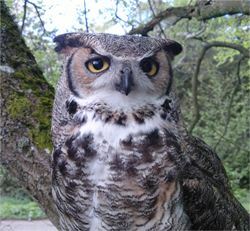 The list above of horned owl prey is merely a list of common examples. Great horned owls prey on five hundred known species of creatures, even going so far as to attack and eat bald eagle chicks, assuming the parent birds are not in the nest. This avian apex predator is speculated by some to be the single most successful predator on the planet Earth. 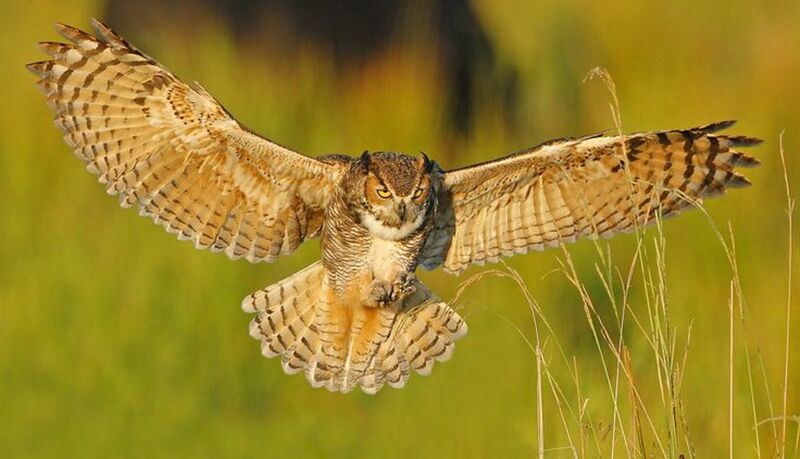 Although they are usually nocturnal hunters, Great Horned Owls sometimes hunt in broad daylight. After spotting their prey from a perch, they pursue it on the wing over woodland edges, meadows, wetlands, open water, or other habitats. They may walk along the ground to stalk small prey around bushes or other obstacles. 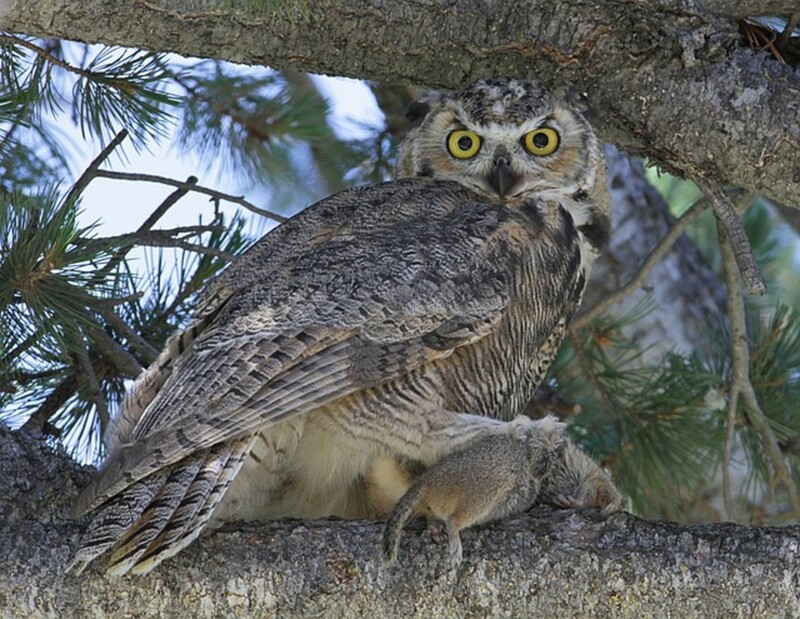 Great horned owls lay eggs weeks in advance of other species of raptors. This gives the owl's chicks a competitive advantage over, say, those of the red tailed hawk. The red tailed hawk, by the way, is a definite competitor to the great horned owls, for everything. The two completely distinct species of raptors share the same ecological niche. These owls spend some time choosing their mates. They start courting in October, make decisions by December, and then are mated for life. These are totally monogamous birds of prey. Besides physical posturing and loads of hooting on the part of the males, the males also do another traditional sort of thing during courtship; you guessed it, they treat the lady to a fine meal of fresh meat. 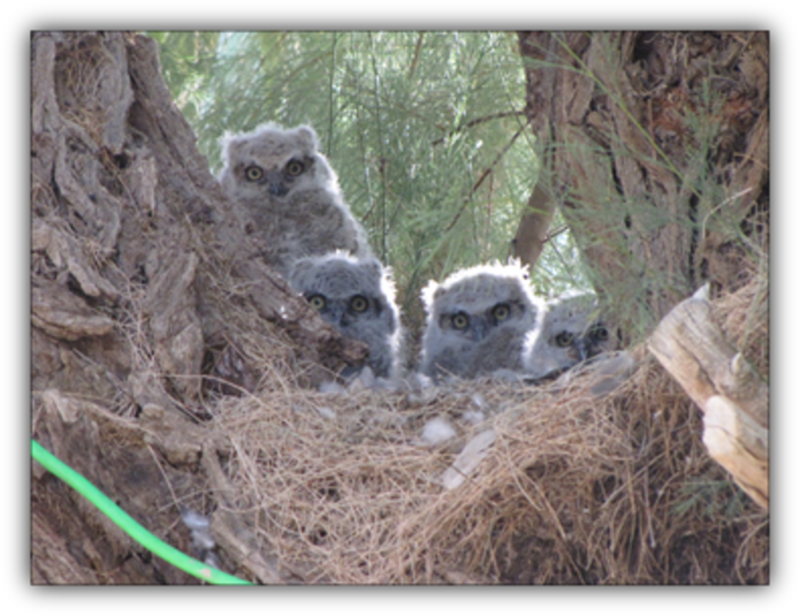 Great horned owl nests are as varied as the vast stretches of land they inhabit. What is most consistent about the great horned owl nests is - they're often stolen from other birds. Why build a nest when you can just take one? It's almost human, this raptor, in many of its admirable and less so behaviors. The laying of eggs is timed according to the region the particular owls inhabit, and the weather in said region. Be advised, again, you are going to be attacked by a large raptor with five hundred pounds per square inch power talons if you disturb a nest. You may be attacked simply for being too close to it, whether you know about said nest, or not. The females stay with the nest unless something dramatic forces them out. The males act like consummate and loving mates during this time, often doing the hunting for both adults, and even stockpiling food for the chicks when they hatch. One nest observed by studying biologist found a full eighteen pounds of meat stored and ready for the chicks in one nest. Eggs are incubated, regardless of the temperature, by the female for 28-37 days before chicks hatch. It's often more than ten weeks before the baby birds can fly competently. So how big are these great horned owls? The female is larger than the male, as a rule. Despite the size difference, the male has more developed vocal abilities, and can hoot with a deeper voice and louder as well. Females weigh around four pounds, three pounds for the male. 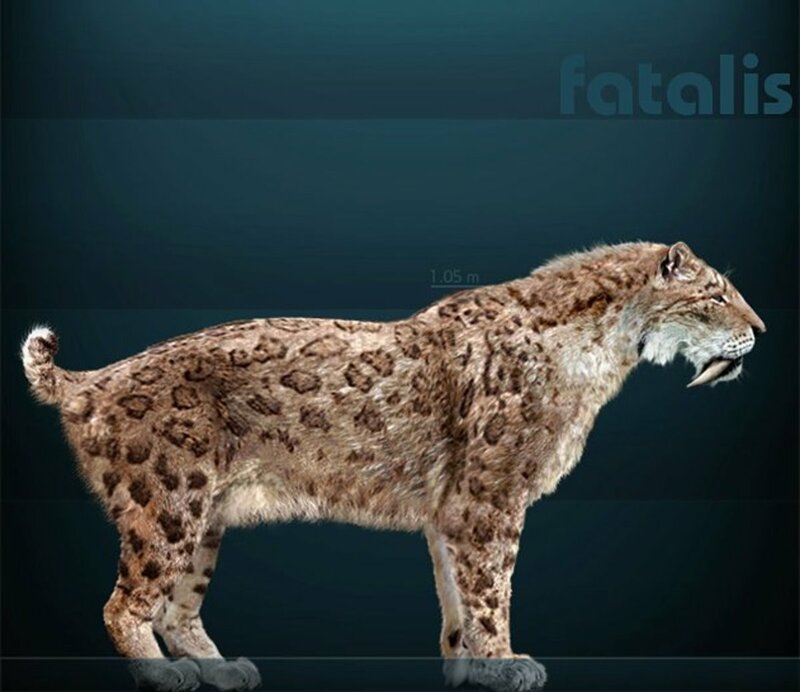 The females usually stand two feet tall, the males a foot and a half. Wingspans are truly impressive, and stretch as far as five feet wide in females, four feet for the males. The great horned owl is a veritable avian apex predator, which hunts and kills at least five hundred known species of creature. But surely these birds have enemies themselves, right? Indeed they do, however, very few enemies of the great horned owl are an actual threat to them. While great horned owls are so bold as to attack and even eat the chicks of a bald eagle, it is a rare thing. Bald eagles have been known to kill great horned owls defending their nests, they do not, however, hunt them. Crows are known to gang up on the great horned owls and harass them for hours and hours at a time, but they can't kill one. Once every blue moon a red tailed hawk gets the jump on the great horned owl, and kills one. There is, though, exactly one creature that literally hunts the great horned owl, and that fearsome and huge raptor is the golden eagle, the sworn enemy of great horned owls. 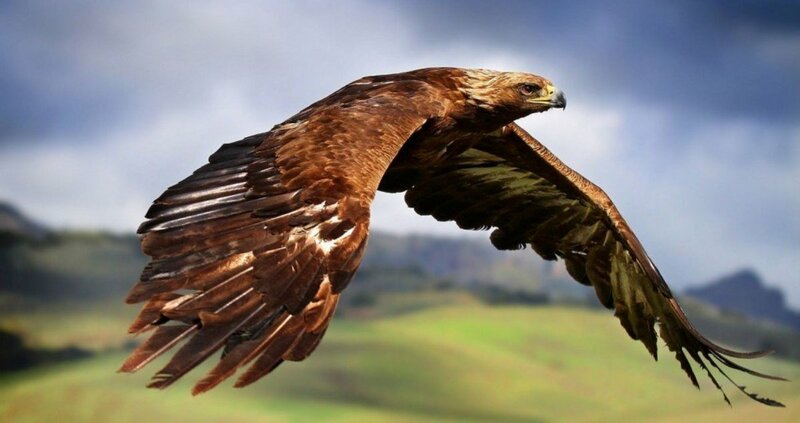 The golden eagle, the sworn enemy of the great horned owls. Those prominent 'horns' on the great horned owl look like big ol ears, don't they? The owl and owls in general are known for outstanding eyes and ears, right? Indeed they are. Owls are all known for having outstanding ears and eyes. Thing about it all is, the great horned owl absolutely has terrific eyes and ears. The eyes of the great horned owl are huge in comparison to the size of its face, and those 'horns' are certainly the ears, right? Wrong. The 'horns' are not ears, they aren't horns either, obviously, those are just feathers, and that is all that they are. Huge eyes and massive pupils allow the great horned owls to collect, with their eyes, all available light while hunting at night. The great horned owls can not swivel their eyes in their heads as we can, however, they can rotate their heads as much as two hundred and seventy degrees in either direction. Who needs swiveling eyes when you can do that? These owls have less ability to differentiate colors than we do, for colors are not what the owl seeks, but rather, movement. The ear tufts, which are only feathers, serve the great horned owls as camouflage, and they shift in position to indicate the bird's moods. As shown in the drawn image above, the actual ears of the great horned owls are not easily visible to the untrained eye, those ears, however; along with those eyes are possibly the greatest surveillance weapons developed by natural selection on the planet Earth. Of course the reader already knows and sees the dish shaped section of the owl's head containing the eyes and the ears. Very satellite like, that. No species of owl is particularly fast as a flyer. 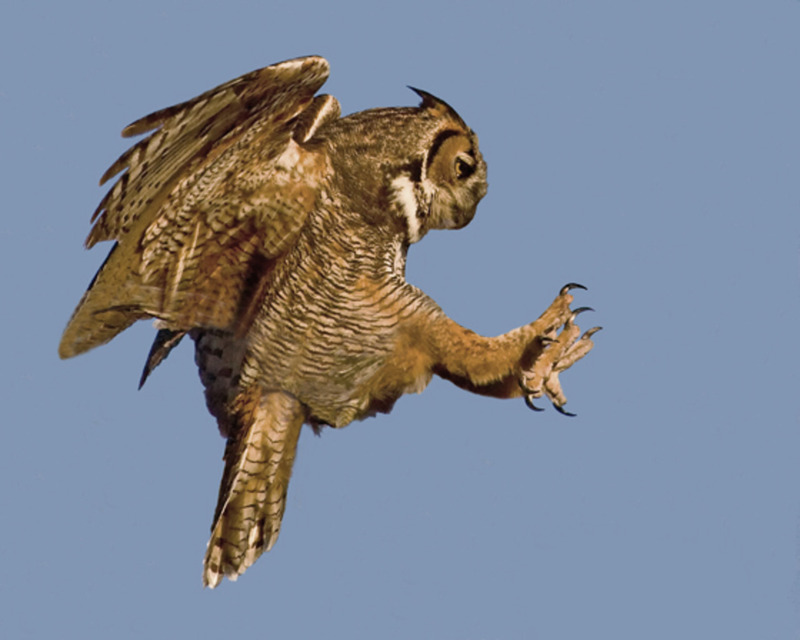 Like other owls, the great horned owl is almost completely silent in flight. They glide more than they ever flap their wings. Near pinpoint accuracy with the dish face, huge eyes, and finely tuned ears - it is simply not fair for the great horned owl's prey. You've been losing your cats, have you? You were sure it was coyotes killing them, huh? Think again, my friend. The great horned owl can kill and fly off with prey more than twice its own body weight, and even were the cat too big for the owl to fly off with, the great horned owl can easily kill one, and get a bellyful on the ground. Instances such as these, prey too large to carry off on the ground and feeding there, are some of the only instances when a great horned owl is ever in physical danger. These magnificent predators live as long as 28 years. I hope to have spread some appreciation, if not love, here for the great horned owls. Thanks for reading, and happy hunting to you. I have a pair of nesting owls with two owlets in my and my neighbor's backyard. I watch them every evening with a scope. The juveniles are flying; they are so incredibly noisy. At what point do the kids leave home? At what age do they seek a mate? Young Great Horned owls are not competent flyers until they are ten to twelve weeks old, but then after that, the time when they leave their parents is dependent upon how much food is available. They are typically gone from a nest before the Fall is over. 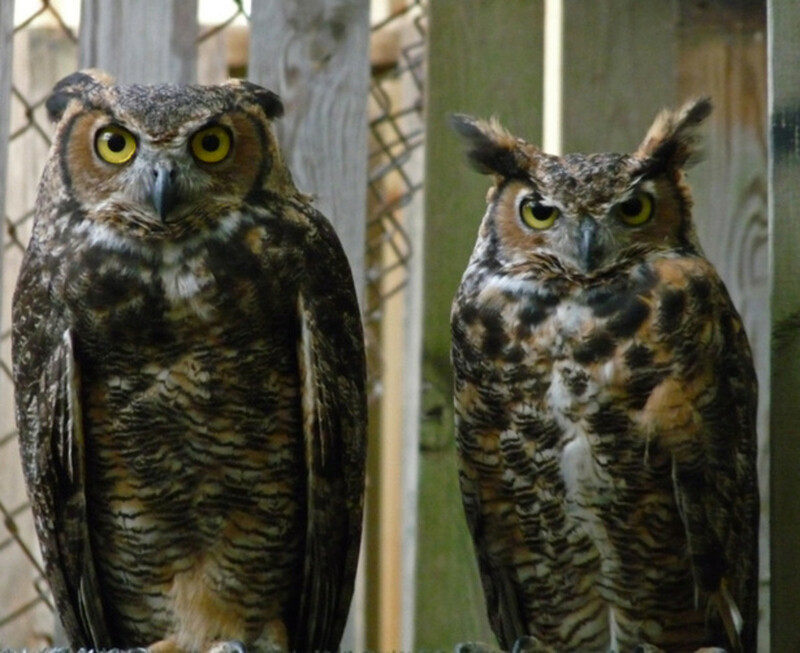 Is it legal to own a Great Horned Owl? You have to have a license to have one. Can owls pass disease through their claws? It is possible such could be the case as an owl's claws are often ripping into prey animals, and there is no certainty as to the health of the prey. Will a Great Horned Owl eventually seek new territory? I saw my first one late this evening coasting from pine tree to pine tree, robbing mockingbird nests. All this with a squadron of mockers dive bombing and screeching. I think if the climate changes the Great Horned Owl could find some new territory. I don't think the other birds could ever chase the Great Horned Owl out of a place though. 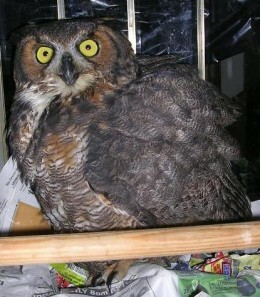 Im a falconer and ive had cosmo my greathorned owl for 17 years.hes a one person bird for sure.very afectionet to me. Good question, Dave. I'm just not the guy who can answer that one. Sounds like a lawyer would have to be consulted. Someone bought a deep empty lot across the street from me, the back of the lot has mature pine trees with what I believe are great horned owls nesting there. Is it legal for this guy to cut all the pine trees down in the back of his property since the owls are nesting there? Its in northern Pinellas county., Oldsmar. Yes. They seem to know where it hurts the most. No wonder they are one of the top predators despite their size. Looking forward to some interesting information on Asian owls too. You just have to be aware of when they have chicks, and know to be careful about them then. I would imagine most all owls are like that, although I do not know for certain. They've all got massive power in their claws, and the human neck, you know, has a blood vessel there which wouldn't be hard for a raptor to puncture. Now you've got me curious, Mohan, about Asian owls! I had seen an owl once from a very close distance in our neighborhood. It was a rare and enjoyable sight. The owl did not mind my presence for some time and then flew away. Back then, I did not know that owls could attack human beings. Anyways, the ones we see here in India are most certainly not the Great Horned Owls. It is strange that a four pound bird could kill an alert human being who is supposedly more intelligent and weighs around two hundred pounds. Kinda like coyotes, Louise, they tend to be heard but not seen. You kinda don't want to get too close to them if you do know where they are. Definitely you don't want to get close when they've got chicks. These are such beautiful birds. I have never had the pleasure of seeing one though. They are so gorgeous. I have not had the pleasure of meeting one of these preditor owls, but their story is fascinating. I love all types of birds, and learning so much about these owls was fascinating. I love all the pictures, and I liked learning all the details of their existance. Sounds like cackatoo is a favorite meal! Great story! 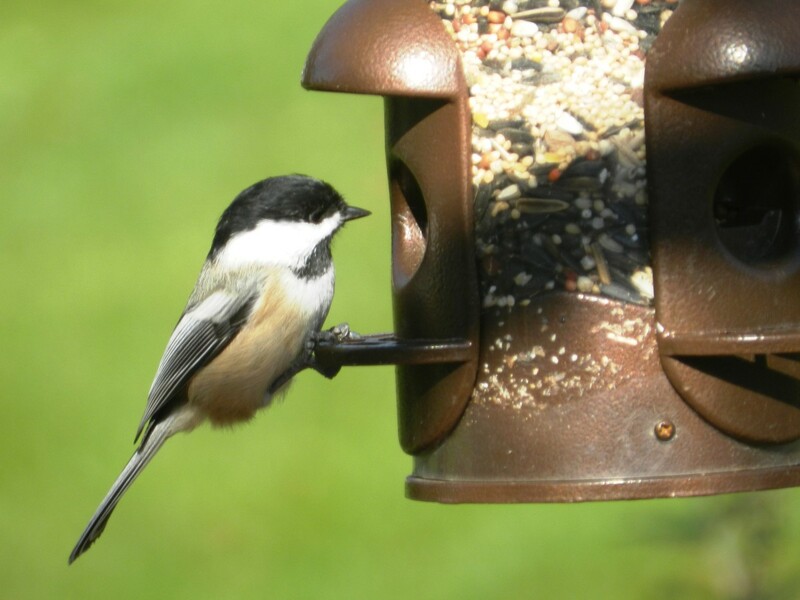 I am a keeper of house birds and also feed wild ones. Yesterday morning at 6 am, a great horned owl was on our patio and my Goffin cockatoo made a blood curdling scream. When I opened the door, the owl left. But last night, he returned. With drapes drawn down, he hit the window with such force that we are surprised that it didn't break. We turned on the patio light, to see him again sitting about 10 feet from the window. But he did this same thing, two more times; hitting the window and us chasing him off. I, too, see them frequently in our yard at dawn and dusk, but never before have I experienced one trying to break into the house. Hey Lassiter, according to my bit of knowledge, which is by no means absolute, they only attack people if a person gets too close to their nest, and then, only if there are chicks in the nest. But hey, those birds are super predators, so who knows? I would never let a small child outside were I to know a Great Horned Owl's nest was nearby. I'd not put it past one to think a small human looked like lots of meals. 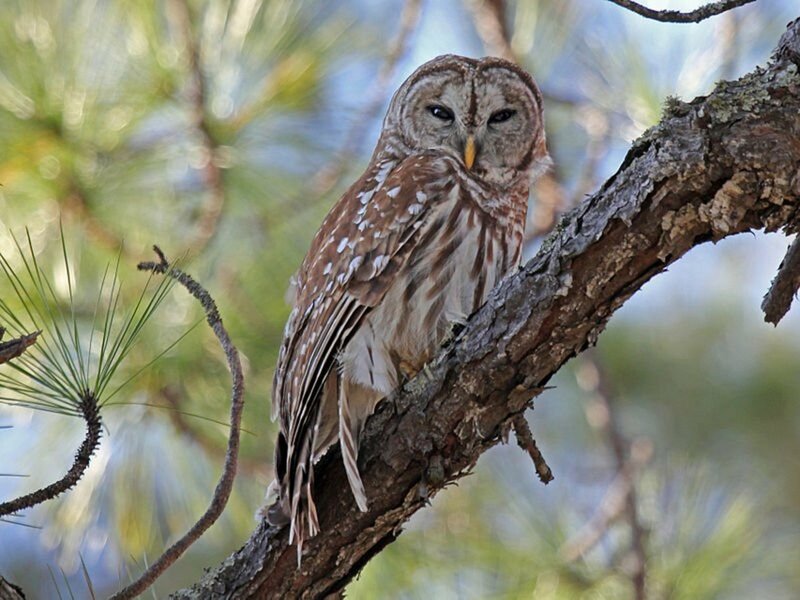 I live in Pensacola, Florida and I believe an owl tried to attack me. I was out at my pool pump and was walking back. I noticed a shadow overhead and it went by a couple of times. I reached the awning over my patio and went into the house, but I was curious so I looked and saw an owl perched on my privacy fence. Sherie I'd love to see the pictures, but I sure don't know about why an Owl would have a fixation for you. I know I'd think it was the coolest damned thing in the world if one was seemingly protective or inquisitive about me. Or, it could also scare the beejeepers out of me. Either way it'd be something I'd like, as I'd feel distinguished. But do be careful. Our neighborhood is full of ours and they are probably barn owls I don't know but I have a question I hear them every night all night mostly but I never ever hear them during the full moon. Do you know why that is? This particular owl began "watching"( for lack of a better word ) me since last summer. Everyone thought it cute at first he would show up every evening, then he tried to land on me. My daughters look just like me and he knows the difference if it's me or them outside. He's not trying to hurt me bc he has walked up to me already. What is going on? I have pics. It went so far as him flying alongside our vehicle looking in the window to see if it was me but turned away when he saw it was my husband. I saw a great horned owl being mobbed by birds this morning. I was out walking my dog & heard a lot of loud bird noise up in a tree. I looked up & saw a large bird facing away from me being harassed by a group of smaller birds ... I wasn't sure if it was an owl or a hawk at first, but then he turned his head and looked straight down at me. Definitely a great horned owl. We hear them hooting at different times of the year in our neighborhood. Occasionally I see one when out for an early run, but this was the best look I've ever had of one. He wasn't that far from me and he sat there for a while, but he was obviously annoyed by the birds & finally flew off. We have a mated pair of Great Horned Owls that come every spring to have their babies in the Palm trees inside our courtyard at work. The first year we were here they had two babies. The following year, they had two but one fell out of the nest and died. The next year, only a single baby. This year they had 3! The biggest one of the three just starting trying out his wings. They're so inquisitive. They've never (to my knowledge) attacked anyone and they look at us when we talk to them, but we never get too close. After reading this article, I may allow a bit more distance. We have Great Horned Owls who nest in our yard. Unbeknownst to us, one of the babies fell out of the nest (unharmed) and my husband was in the yard and an adult owl attacked him, which I witnessed. SO SCARY! They are incredibly powerful. Oh yeah, started with chicken hearts and gizzards and once he was able to fly gave him as many mice a day he could eat. He was so docile and tame I hated letting him go but the mice were getting expensive. Could be he was raised by someone or a wildlife rehabber and released that summer before I found him. I have two screech owl nest boxes I have to relocate. They are in Ash trees that are now dead. Man I have a dozen dead ash trees on my property I have to cut down thanks to the emerald ash borer http://www.denverpost.com/news/ci_29532816/report-... The electric company comes through every year and cuts down any ash trees near enough to fall on the lines and already got three of mine but I have more off the road. That is one damned fine looking bird! Looks like you fed the feller well! Wes, just download a recording of their hooting during mating season, sit quietly at dusk or dawn play it loud and watch (bring a flash light). You'll hear them off a mile away before they appear. Thanks Ann! I just happened into that first photo, and it inspired me to read about the bird and write the page. I had a strange encounter late one night way out in a rural area where one of the great horned owls was just standing next to a stop sign. I've only ever seen one on one other occasion. Makes me want to buy some high dollar night vision goggles! I adore birds of prey and this one is magnificent. I love the first photo; stunning! I have nothing but admiration for such creatures. They have to survive so that's why they behave the way they do; some would call it cruel, horrible, whatever, but their skills are honed to a fine art. Thanks for all the information; didn't know about the ears. I've spent many hours at a Hawk Conservancy in Hampshire; a wonderful place which offers about the only opportunity to get up close to birds of prey. I'd willingly work there but it's two counties away! I used to know a boy who went to my primary school who had a pet chough; it spent most of the day on his shoulder - not in school though! Crows! Heh, you're the only person I've heard of with a pet crow! Those birds are smarter than most people think they are. 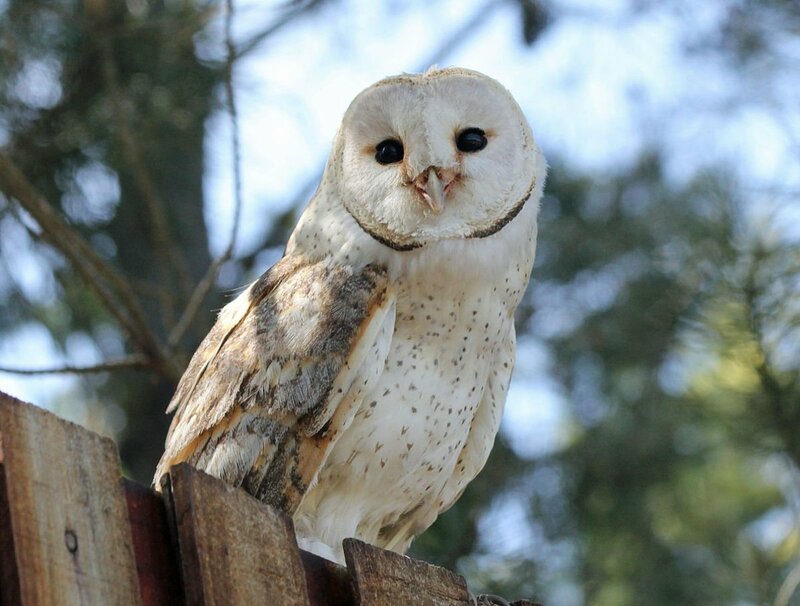 I had a pair of barn owls I raised from babies, long story but I got them from the tower of an old building in the middle of my college campus where a Barn Owl nested. There were literally dozens of people walking around the campus under the tower (three stories up) and in the building day and night. The owls were really interesting "pets" but the best pets I ever had were my crows. I wrote about all this stuff in my Hub Pages but how about you doing a Hub Page on the saw whet owl. I found one once in a snow storm by the railroad tracks - obviously must have flown into a train in the snow storm, but reading about them I found them to be quite interesting. Wish I had those experiences. I know the horned owls eat smaller owls, but I figure they mostly feel like they're just removing some of the competition! Damn, that is a problem with the poisoning of anything, the unintended consequences. Wild that a wild owl would be tame, but then again they probably have the ability to sense things we don't understand all of. It seemed to sure know you weren't a threat. I'd read that persons into falconry have had some success with these owls, but only the younger ones - as they get older they don't follow instructions so well! Moonlake - that is AWESOME! I've only seen a few of them in person in 'the wild.' One night late at night and in the rural sticks a friend and I saw one standing at a crossroads late at night, off to the side of the road, near to a stop sign. We were so unsure of what we saw (while driving) that we turned around and went back, got out, and walked near to the bird. There it was, just standing there - looking large and fearsome. "Don't get too close!" My friend said. We stood and looked at it for a minute or two, it never moved, just stood there. I think surely the bird was injured or something, but I couldn't tell by looking at it, it was a wild experience. Well done Wes, these birds are so awesome. I've had screech owls as pets and spent a lot of time and nights playing recordings of owls to draw them to me. With recordings in mating season I've drawn screech owls so close to me I actually grabbed one out of the air once. Once at dusk I was watching three screech owls I had drawn to me (two males were courting thew female) with a recording of their voices and decided to play the great horned owl recording. The screech owls instantly disappeared, the are prey of Great Horned owls. I also nursed a Great Horn back to health one winter just 5 years ago. Saw him fall to the ground in the snow in the back yard. I think he had eaten mice that were poisoned by rat poison. I gave him vitamin K and in a few days he was good as normal. Actually it was strange because he was totally tame with me, sat in a parrot cage all day and would let me walk around the house with him perched on my (protected) arm. In late winter I put him in an aviary outside. Whenever I'd approach him he'd make a clicking noise, very loud and distinguishable. I'm still not sure if it is a warning or a sign he liked me! Eventually, when I got tired of buying mice to feed him, I left the door to the aviary open and after a couple days he left. We had run into town with our other kids to get groceries. When we got home our 14-year-old son stood in our kitchen with a great horned owl on his arm. He was lucky the bird didn't take his eyes out. He found it in a trap. I don't know if it was so calm because he saved it or because it was in shock. He took it outside raised his arm high and it flew off. He had a heavy jacket on that is what saved his arm. It had been caught in the trap by one of its talons. Somewhere around here, I have a picture of him holding that bird. Yes, the humans could learn a thing or two about mating and child rearing from the great horned owls. Mating for life and caring totally for the young isn't so common in humans! There are animals in that there diet I have never even heard of, like a vole and mergansers. 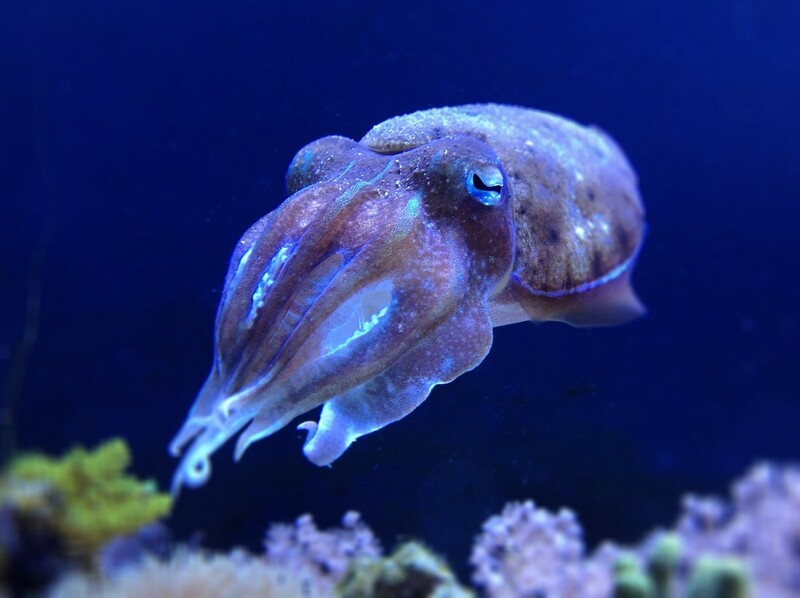 The one thing about this creature, like many others, is that they take care of their family. It's kind of romantic when you think about it. I'm in love with this great horned owl.